Panasonic, an industry leader in rugged, reliable mobile computers since 1996, announced today at the 2013 Consumer Electronics Show (Las Vegas) that it has expanded its Toughpad(TM) line of enterprise-grade tablets with the introduction of the Toughpad(TM) FZ-G1, a 10" tablet featuring Windows 8 Pro, and the availability of the Toughpad JT-B1, a 7" Android(TM) powered unit. Both devices follow the original 10" Android-powered Toughpad FZ-A1 which became available late last year. With the Toughpad family of ruggedized tablets, businesses and government institutions have a single partner delivering a selection of highly reliable and purpose-built devices ideal for numerous operational needs. "Panasonic has been the industry leader in engineering the most reliable and rugged mobile computing devices such as the Toughbook," said Susan Black, Director, Sales and Strategic Marketing, Computer and AV Solutions, Panasonic Canada Inc. "We believe our engineering and reputation for reliability, backed by our world-class service will result in the Toughpad family being the leading B2B tablet solution in Canada." Hide Harada, Director, IT Products Business Unit added, "The goal for Panasonic is to achieve 50% market share in the ruggedized tablet space by 2015." Toughpad tablets are designed for mission-critical and highly mobile workers in fields such as the military, oil and gas, construction, healthcare, public safety, utilities, retail, maintenance, supply chain logistics and insurance. The devices are ideal for a host of usage scenarios, including inventory control, eForms, field sales, field service, route delivery, eCitations, electronic medical records, inspections, mobile point-of-sales and GIS. --  Dimensions: 10.6" x 7.4" x 0.75"
wired LAN, true serial port or dedicated GPS. --  Dimensions: 8.7"x 5.1" x 0.7"
Toughpad tablets are MIL-STD-810G tested for drops, fluid ingress and temperature to assure they deliver reliable performance under circumstances that render typical tablets non-operational. 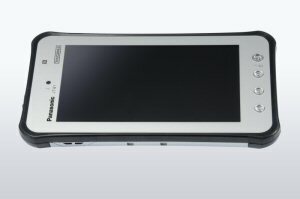 Devices feature daylight viewable screens, user-replaceable or serviceable batteries, a stylus for signature capture and handwriting (on the FZ-G1 and FZ-A1 with 3rd party apps), and multiple options for peripheral connectivity. "Years of customer input have greatly influenced the design of our Toughpad," continued Black. "The feedback is a critical part of the development. The fact that we have a wide variety of devices in the Toughbook and Toughpad families proves that we build products to meet our customers' needs." Toughpad tablets are supported by a full ecosystem. Panasonic will also offer a set of professional-grade accessories to support the Toughpad line, including apps, cases, mounts, printers, keyboards, magnetic stripe readers, smart card readers and multi-unit storage and charging solutions. The 10" Windows 8 Pro-based Toughpad FZ-G1 will be available in late Spring. The 7" Android-powered Toughpad JT-B1 will ship in March. The 10" Android-powered Toughpad(TM) FZ-A1 is now shipping. All Toughpad tablets can be purchased through authorized Panasonic resellers. All products in the Toughpad family come standard with the industry's most comprehensive 3-year warranty. Requests for more information or sales inquiries for Panasonic's Toughpad family of tablets should be directed to [email protected] or 1-866-413-3099. Panasonic Canada Inc. is a subsidiary of Panasonic North America, one of the world's largest producers of electronic and electric products for consumer, business and industrial use. 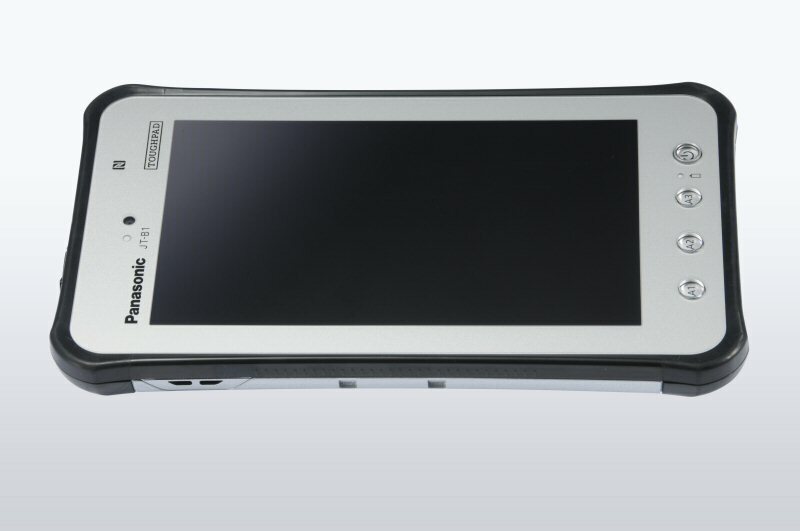 Information on Panasonic's Toughbook Notebook solutions can be obtained by visiting www.panasonic.ca. To view the photo associated with this press release, please visit the following link: http://www.marketwire.com/library/20130111-Toughpad800.jpg.